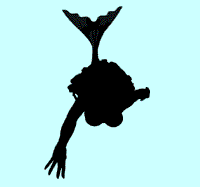 Mermaids are often portrayed as powerful supernatural beings in ancient Celtic mythology. They are frequently attracted to mortal men which creates a situation ripe for disaster. Duke Magnus was once the object of a mermaid's affection, but he had no interest in her. She offered him a boat that could sail on sea or land, but he was not interested. She offered him a horse that could run on land or sea, but he was not interested. Changing her tactics, she offered him gold and pearls. This got Duke Magnus' attention, but he rejected her again. He could never marry anyone who was not a Christian, he said. The mermaid made a final offer: if he didn't marry her he would go crazy and die insane. Duke Magnus apparently did not take this seriously and rejected her. He went insane and died that way many years later. Anna, the beautiful young daughter of a fisherman, is in love with Sir Brynolf but they cannot marry. Duke Magnus comes to Anna's village in search of a mermaid he believes will bring into the lake and grant him peace. There he sees Anna and is attracted to her. Anna's father becomes aware of the attraction and wants to use it to have them marry. He plots with a monk to bring them together. Later, the tormented Duke hears sounds coming from the lake. He goes to the shore and sees Anna, who pretends to be his mermaid. She calls to him promising peace and the Duke jumps into the lake. Sir Brynolf hears Anna's cry of alarm and rescues the Duke from the lake. Anna and Sir Brynolf are called to the castle where Lord Sten, Brynolf's father, tries to ascertain what happened at the lake. He suspects that Anna tried to trap the Duke into killing himself. The Duke enters at this point and sees Anna again, and again thinks she is his mermaid. The two argue and the Duke draws his sword. Sir Brynolf draws his to defend Anna and he and Anna dash off. At the lake again, Sir Brynolf is attacked by the monk but Lord Sten arrives and arrests him. Meanwhile, Duke Magnus has also arrived and watches the proceedings in bewilderment. Fortunately, he regains his senses at this point and realizes that his mermaid is only a dream. He agrees to the marriage of Sir Brynolf and Anna, who turns out to be a princess. Only in operas! For those interested in all the gory details you can read the complete libretto, in English, at Naxos.